Tree of Life Educational Fund » The Golan is Occupied Syria! Each year for our Tree of Life journey, we urge our travelers to recognize not only the occupation of Palestinian land and resources in an insidious system that can only be called Apartheid, but we also visit the unrecognized Bedouin communities of the Negev where Bedouin, even though citizens of Israel, are treated as second class citizens, a system painfully similar to Jim Crow, separate and unequal. 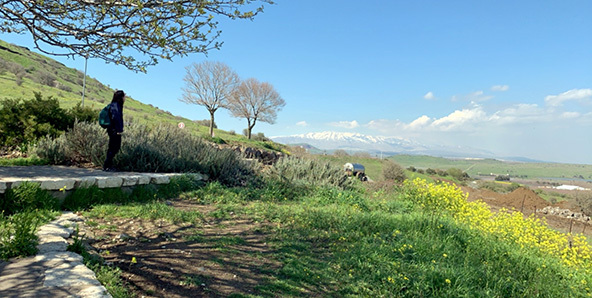 We also visit the high plateau above the Sea of Galilee commonly known as the Golan Heights. The Syrians who live there refer to it as Jawlan. This is a spectacularly beautiful area confiscated by Israel after the Six-Day War of 1967. 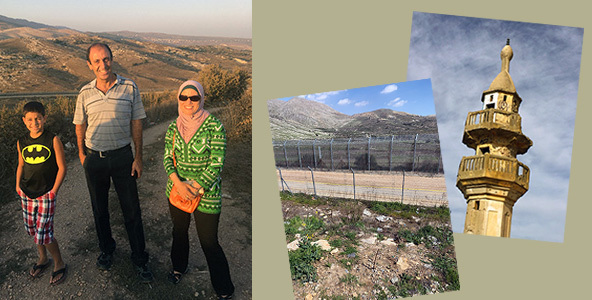 Left: Dr. Taiseer Maray with Bilal and Ghoufran Allababidi; right: Golan Heights border fence and damaged mosque minaret. In the ascent of Jawlan or Golan Heights, in contrast to the West Bank, there are no check points that one has to cross, evidence that Israel, against international law, has long since annexed land that belongs to the people of Syria. Evidence of the Six-Day War can be seen in a bombed out Mosque in which our groups frequently stop for interfaith prayer to recommit ourselves to overcoming all forms of Islamaphobia. On the way to the Syrian city of Majdal Shams, one can see abandoned tanks and open land mines in which children, pets and livestock have been horribly victimized. In our conversations with the Syrians who live there, we hear about how even though water flows freely down from the snows of Mt. Hermon, there is an unequal and unjust distribution of water for the Syrians in contrast to an ample supply of water, 24/7, for the many illegal Israeli settlements in the region. When enterprising Syrians build cisterns, the Israeli Defense Force (IDF) shoot holes in those cisterns and do nothing to protect the Syrians from open land mines. In Majdal Shams, Syrians can look across a militarized fence to the hills of Syria beyond. Our friends in Jawlan speak with tears in their eyes about how they sometimes use bullhorns to speak to their Syrian families on the other side. One of our friends has been separated from his brother for over 50 years, and now that his beloved Syria is being ripped apart by violence, he laments how this has precipitated an international refugee crisis. The good people of the Jawlan have urged us to hear their cry for justice and human rights. Syria has suffered far too much from colonialism and proxy wars. This land of beautiful apple and cherry orchards, delectable mountain honey, and a rich Syrian culture deserves the attention and respect of our international community. In our Tree of Life Journeys, we urge all our travelers to come back home more determined than ever to be champions of human rights, not only for the Palestinians of the West Bank and Gaza and the Bedouins of the Negev, but also for the Syrians of the Jawlan. With President Trump’s recent announcement in support of Israel’s annexation of Golan, now is the time for all of us to call or write our elected officials to let them know of our disapproval! Our good friends, the Syrians of the Jawlan, need our support! Pictured here is the youngest member of our most recent Tree of Life journey. 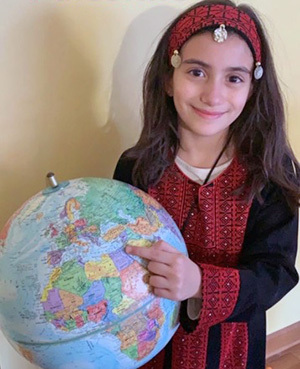 Her family has deep, deep roots in Syria, and when she gets back home in a few days, knowing her as I do, I know she will be eager to show her classmates where she visited in the Jawlan and how that beautiful land needs to be restored to the people of Syria! Please let’s join Sena in this effort! Call your elected officials today!